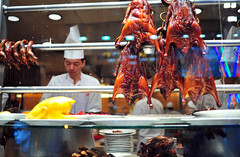 Roasted geese, bronze and juicy, hang in the big picture windows at Yung Kee. They’re the restaurant’s calling card. And by some accounts, they’re the only reason to visit this aging institution on Wellington Street in Central, Hong Kong. It’s certainly not for their hospitality, from what I could tell. Westerners will probably feel a chill from the slapdash service. But make no mistake, brusqueness here might be more accurately translated as efficiency. And efficiency translates into more profits. 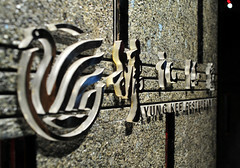 Make no mistake, Yung Kee is a cash cow, or the goose that lay the golden egg? You’re just a number here. Table top real estate is highly coveted. Waiting is expected. Like many of the old-guard Chinese restaurants, Yung Kee is all about hierarchy. The commoners are herded into seats on the ground through third floors, so I’ve been told. There’s a “VIP” dining room on fourth floor, for those who are willing to make an effort. For the experts, (the “real VIPs”), there’s a dining room on the eighth floor. And, since exclusivity breeds rumors, I’ve heard whispers of a tenth floor dining room. Either I was lucky, or getting a reservation on the fourth floor isn’t hard. I did it by simply calling up a few weeks in advance. The menu here is extensive. And depending on your level of savvy, you’ll have access to different parts of it. I’ve heard of and seen photos of amazing food from Yung Kee’s upper echelons, and it’s nothing like the sort of food that is offered on the floors below. There being only two of us – Mr. RBI and me – we were limited in what we could order (not by the restaurant, but by our stomachs and propriety). Still, we managed to conjure enough food to feed three times the size of our party. CLICK HERE to see all of the photos from this meal. The sliver of the menu we experienced was passable. As I was not with a regular diner, I can’t be sure that what we got wasn’t the “gwailo Special,” as one acquaintance put it., though, after hearing about my experience, one local told me that I got the typical Yung Kee experience. *shrugs*). Nothing, save the “Braised Bean Curd” was particularly outstanding. But then again, given that I tend to love things braised with shrimp roe, perhaps the hot pot of dofu was just run-of-the-mill. It was the kind of addictive comfort that makes you want to crawl into the bowl and fall asleep: fat, fried bars of delicate dofu braised in a thick sauce rich with sea umami and threaded with ribbons of “bean flake” (dofu skin). The meal could have started and ended here. None of the restaurant’s “specialties” impressed, least of which was that old bird, a lifeless heap of tired, meatless, and mangled “Roasted Goose.” The skin had softened and slacked. The grease had pooled and started to congeal. We seemed to have gotten a plate of scraps. The “Preserved Eggs,” which seems equally famous here, were not only mediocre, but overpriced at HK$8 per half egg (well, arguably everything at this restaurant was overpriced). Our two halves were clearly not split from the same egg. The yolk in one half was stiff, a touch under-ripe for my taste. The other one, however, had gone straight to ooze – a creamy, almost runny consistency that was decent. The best part of this dish, in my opinion, was the carpet of bright, rosy carpet of pickled ginger that garnished the plate. “Preserved Pig Trotter” wasn’t bad. But again, I’m not sure why it deserved to be clearly marked as an award-winning dish. 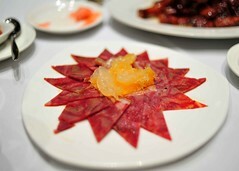 A thinly sliced trotter terrine pocketed with collagen, fat, and meat, this was essentially Chinese charcuterie. 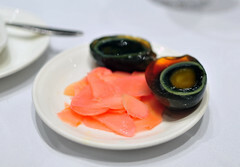 Like the Preserved Eggs, the best thing on this dish was the garnish, a frilly tuft of jelly fish lightly coated with a spicy soy sauce and vinegar dressing. 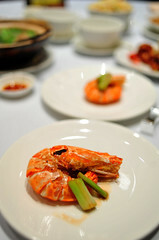 The two surprises of the night were the “Fried Rice “Yeung Chow” Style” and the “Giant Prawns,” a special that day. I prefer Cantonese-style fried rice to more northern Chinese styles. 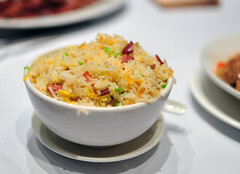 The Cantonese use a shorter grain, making a heftier, stickier bowl of rice. This one was very good, having been stir-fried with the traditional mix of egg, ham, and scallions. There were three or our nicely sized shrimp buried beneath the heap of rice, kept warm, plump, and juicy. This bowl was big enough for three or four to share, or a generous helping for two. We each ordered a “Giant Prawn.” The size of a very small lobster, each was grilled and presented with nothing more than a couple of pieces of grilled scallion stalks as a garnish. Beneath the armor-like shell was a firm, meaty – but not overcooked – body full of moisture and sweetness. Like a suckling, I drained the heads of their goodness, the most rewarding part of the experience. The rest of our dishes were fine, nothing special. 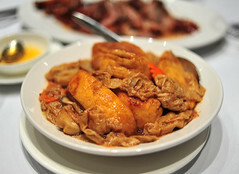 Scallopine of eel, curled and glazed with a sticky sweet and sour sauce, were tough but flavorful (“Eel Balls with Brown Sauce“). A “Mixed Vegetable Hot Pot” was decent enough, rife with greens, mung bean vermicelli, and a smooth round mushrooms. Where Yung Kee hit the mark, it hit it rather squarely. On the flip side, where it missed the mark, it was downright depressing. 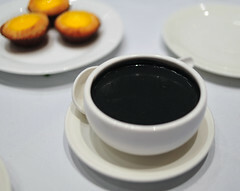 Inky and rich, “Sweet Sesame Soup,” served warm, was quite good; a solid, sweet ending. The “Mini Egg Tartlets,” unfortunately, were repulsive. Also served warm, they were stale and bland, the crust greasy and dense, overladen with lard. I enjoy the flavor of pork in beans and sausages, not in my egg custards. The fourth floor dining area is a narrow corridor of tables with doors opening into private dining rooms. It wasn’t the most comfortable or welcoming space, but it was a shade less hectic than the circus on the floors below. Yung Kee just might be one of those restaurants better saved for a time when you can get invited by a regular. Judging by this one visit, I’m quite surprised that it’s so highly praised and recommended, no less a Michelin-starred restaurant (one more piece of evidence that the Michelin guide is shipwrecking its thinning reputation in Hong Kong). ~ by ulterior epicure on March 14, 2010. Gwailo special? Lol! Did they have a bilingual menu or a separate English menu? @ Rich. I don’t recall. I’m pretty sure the menu is bilingual. I speak enough Mandarin to get along well enough, so I really didn’t rely on the menu too much.